- Window seats may feel narrower to come as the armrests are placed "into" the "curvature" of the cabin. - Seats with no windows feel even more narrower as there is no space created by the curvature of window. - All bulkhead seats have very limited legroom. - Seats 15A, 16A, 16F, 17A and 17F have limited windows. - Exit rows 19 and 20 have more legroom than regular preferred seats. But eh, you buy cheap, you get cheap. If if the s* hits the fan, whose fault? Ironically, due to the GTF snafu the MAX looked like the better choice until Sunday. take-away = Lion Air pilot error for departure with sensors indicate negative angle of attack while on the ground. MCAS fault only appeared because failure to abort flight. Ultimately, system failure that aircraft design flaw only one aspect. when I teach SMS, share this article, as damage from hitting iceberg was just part of the system failure. MAX concerns are just symbol of complex world that requires as simple explanation as possible for mass public. Should sensors that are only 4 or 5 months old need repairs? Seems like quite a short lifespan if true. Clearly not - having said that, A pitot is basically a fancy straw with ~1 cm internal diameter. It isn't hard to imagine how it could get plugged up with debris, insects, etc. Then why don't they collude and agree to announce at the same time? Easiest way to do that would be to all meet with the transport minister and make a joint declaration of a voluntary decision to ground. Interestingly, Boeing makes it an extra cost option to have a warning indicator when the sensors don't agree with each other. Lion air did not purchase that option, so it wasn't obvious to the pilots that there was an issue. Boeing is likely now asking themselves why this would have been an optional extra. Not sure whether AC got the warning light or not. You are absolutely right in terms of system failures. Aircraft accidents these days (including Lion Air) are usually a combination of multiple things going wrong - if any of those things had not happened all together, there would not have been an accident. Sometimes referred to as aligning Swiss cheese - usually you can't see through several slices of Swiss cheese but every once in a while the holes all align and that's when the accident happens. skybluesea and Mauricio23 like this. ....MAX concerns are just symbol of complex world that requires as simple explanation as possible for mass public. The public is too freaked out to listen to reason. Even looking at FF sites like FT airline forums (particularly AA and even UA which doesn't even have this particular model), posters are too freaked out. Some people are prone to fear when they don't understand things. It is what it is. I posted this upthread yesterday as it has implications. Two days ago, the AA FA union issue a memo that became public and I suspect that led to the AC FA's thinking about the same thing. Now, how does it look to the average flyer, that FAs may be allowed to not fly the MAX? It certainly does not reinforce confidence. "Travel agents and websites have begun to respond to consumer concern and the grounding of Boeing’s 737 MAX planes, by changing policies and introducing options to allow customers to choose the type of aircraft they wish to fly on." I don't have a personal comment on whether I would fly the MAX or change my flight plans if I'm scheduled to be on it. I am simply pointing out what we all know, the vast majority of people who fly do not understand how to airport, let alone how to determine aircraft safety. It isn't about knowledge, since even the experts don't have all the answers. It's about predictable human emotions and behaviour. Garneau newser now put off until 1130EDT. Last minute lobbying? Clearly this is not enough to determine a cause yet. Nevertheless, there is a pretty clear parallel between the two take-offs. Perhaps the Honourable Payload Specialist is waiting for his software upgrade. 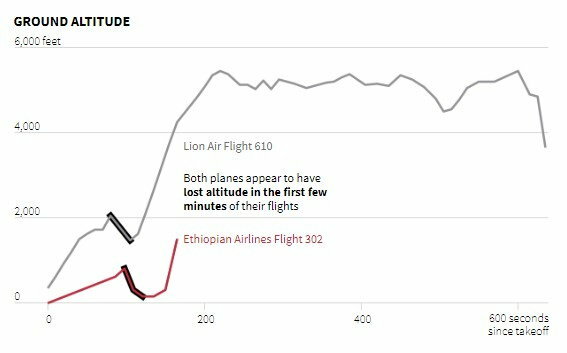 take-away = Lion Air pilot error for departure with sensors indicate negative angle of attack while on the ground. MCAS fault only appeared because failure to abort flight. Is this true? I didn't get that sense just from this particular article. It just stated that the two AOA sensors disagreed by 20 degrees, and that a warning light wasn't part of the delivered package. Should the pilots have known about this disagreement? Do the AC 7M8 planes have that warning light? Anybody know? I have to say, this particular issue aside, I would love to have this flexibility generally. Searches generally on matrix etc., where I can exclude Embraer garbage, 7M8s, etc. 1. There should not have been an MCAS in the first place, but a tail that was able to do its job properly. 2. To make things worse the MCAS was so poorly designed that it was an accidewnt waiting to happen. It almost loos like engineers at Boeing being pissed off by having been overruled by management, consciously or unconsciously, did their best to make the MCAS into a disaster. Having the thing depend upon one and only one notoriously unreliable primary sensor (these, including pitot, are invariably the weakest link in computer-based controls) was borderline criminal, the remedy (or more accurately the symptom relief stuff) being worse than the disease. 3. So fixing the MCAS as it stands may lower risks of accident by a factor ten or so, from the current rate of one every three months (admittedly a conservative estimate). But even then, the Max is still going to be less safe than for instance first generation 320s. Way worse than the public, and the aviation world, his expecting today. I sure home there will be some certification authority with the cloud and the guts to force Boeing to redesign the tails, and retrofit, even if that places them on the verge of bankruptcy. But no, I don't hold my breath. Then maybe a continued sequence of crash will end up with the same result, unfortunately?